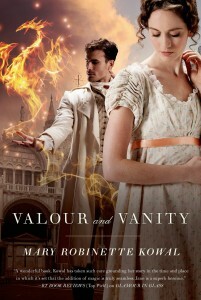 Jane and Vincent are back in the fourth Glamourist Histories book, Valour and Vanity. Lord Byron has invited them to visit him in Venice, and they’re looking forward to the opportunity to work with the famed glassmakers of Murano to develop their method of storing glamour inside glass. However, things go horribly wrong as they’re attacked by Barbary pirates on the way and lose all their possessions. This series keeps getting better! The blurb for this book advertises a heist, so I don’t think it’s a spoiler, even though it happened later in the book than I thought it would. I was somewhat skeptical about the circumstances that would lead to the Vincents needing to perform a heist, but Kowal makes it pretty believable that they have no other choice (especially given Vincent’s well-established stubborn streak). I’m a sucker for heists, though, so I probably didn’t need that much convincing. I’m not really in a paragraph mood today, so I’m going to finish off this review with bullet points. The heist itself was very well executed (Kowal thanks Scott Lynch in the credits, and he’s basically the fantasy heist god, so there’s that). The hidden plan-within-a-plan was pulled off very smoothly, especially given that we see the whole thing from Jane’s point of view and know that there’s a hidden plan. I’ve always loved Venice as a setting – I loved it when I visited, and watching my husband play through the Assassin’s Creed games also makes me feel like have a certain familiarity with it. Murano isn’t Venice, but it’s close, and Kowal captures the feel of it really well, even though we see it at a low point in its history. I loved the supporting characters! The nuns, Signor Zancani, and especially Lord Byron! It’s so cool that Lord Byron is a character, and he’s every bit as rascally as I would expect, but also every bit as brilliant. And it makes so much sense that he would be friends with the Vincents. I learn so much about history from these books. I didn’t know anything about the kingdom of Lombardy-Venetia, and the troubles faced by the glassmakers of Murano. Jane and Vincent go through some pretty hard times in this book. While I don’t exactly enjoy it when they go through yet another harrowing experience, they grow a lot from it. In Glamour in Glass, Jane was shocked by French sensibilities, in Without A Summer, she recognized her own prejudice about Catholics. In this book, she learns what it’s like to be poor, and to fall from nobility – there’s a particularly poignant moment where she makes a single impulse purchase. The next book, Of Noble Family is going to be the last Glamourist Histories book, and it comes out in April. I have an ARC, though, so expect a review soon. I’m sure it will be just as good as the rest! This entry was posted in Books, Reviews and tagged book 4, fantasy, fiction by Kriti Godey. Bookmark the permalink.